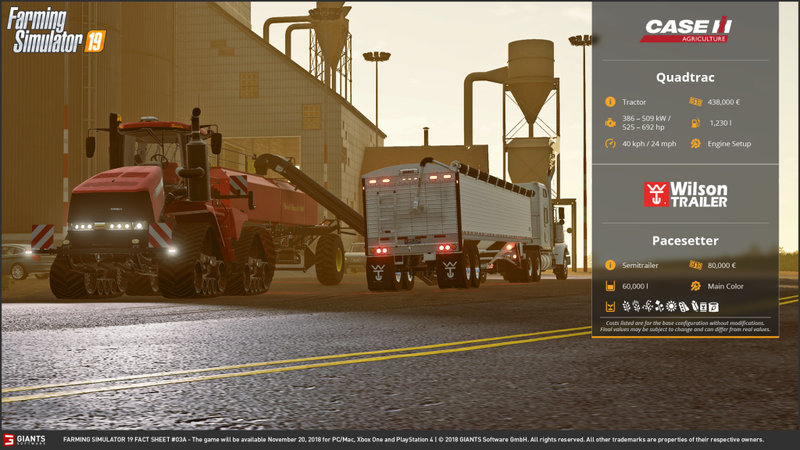 GIANTS Software has released the second set of fact sheets providing details on some of Farming Simulator 19‘s vehicles and equipment. 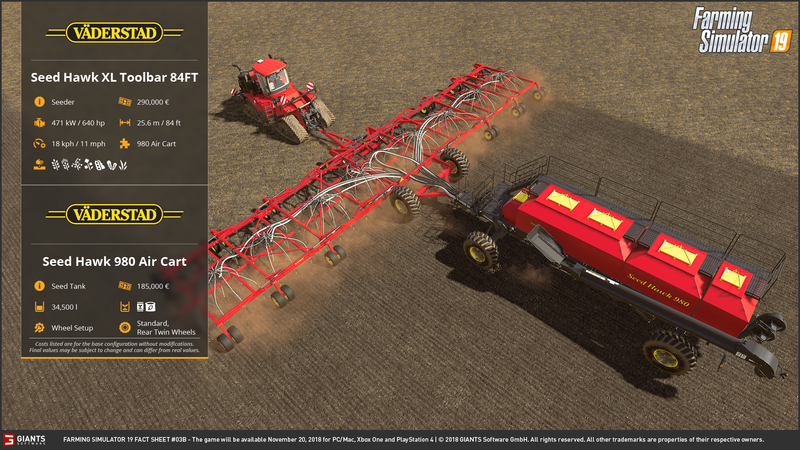 The developer is planning on sharing fact sheets each Friday in the lead-up to the game’s November 20 release date – the first “Fact Sheet Friday” showed us the AGCO IDEAL, John Deere 8R series, and more. Just as they did the previous week, GIANTS has released four fact sheets. 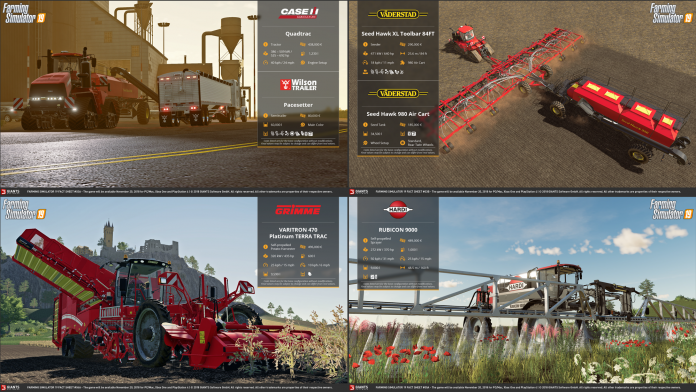 This time around, GIANTS decided to showcase the Case IH Quadtrac pulling a seeder, the Wilson Trailer Pacesetter, a Grimme potato harvester, and the Hardi sprayer we saw in the Gamescom trailer. The Case IH Quadtrac is one of the most powerful tractors available in agriculture today, and has similarly been a longtime staple in the Farming Simulator series. It doesn’t have many options, with the only customization being its engine size – the Quadtrac ranges from 525 to 692 HP. With that kind of power, it’s likely capable of pulling anything in the game. The Wilson Trailer Pacesetter has had fans excited ever since it was shown in a screenshot during the Electronics Entertainment Expo in June 2018. Here we see that the trailer will hold 60,000 L (approximately 1,700 bushels) and that it’s able to transport wheat, barley, oats, canola, sunflowers, soybeans, corn, solid fertilizer, and seed. Players will be able to customize the trailer by choosing the main colour, though it’s unknown what colour options will be available. The fact sheet shows that it will be possible to unload seed or fertilizer from the bottom of the Pacesetter (hence why many people call them “belly dump trailers”) into an auger to fill seed carts – it’s not known if augers aside from those attached to seed carts will be in the game, but players could use conveyor belts to achieve the same effect and fill other seeders or fertilizer spreaders. The fact sheet also clearly shows a cover that can be extended to protect the contents of the trailer from rain – this doesn’t mean that rain will have a greater impact in Farming Simulator 19 though, as this has been an option on many different tipper trailers in the past. Further, GIANTS has confirmed via Facebook that the Pacesetter will feature two separate 30,000 litre compartments, which means that players should be able to haul two different crops at one time if they wish. Finally, the truck shown pulling the trailer appears to be the Lizard Roadrunner, which has been previously shown in other screenshots as well. This seeder was brought to Farming Simulator 17 as part of the Big Bud DLC pack, and it’s great to see it return to the game. 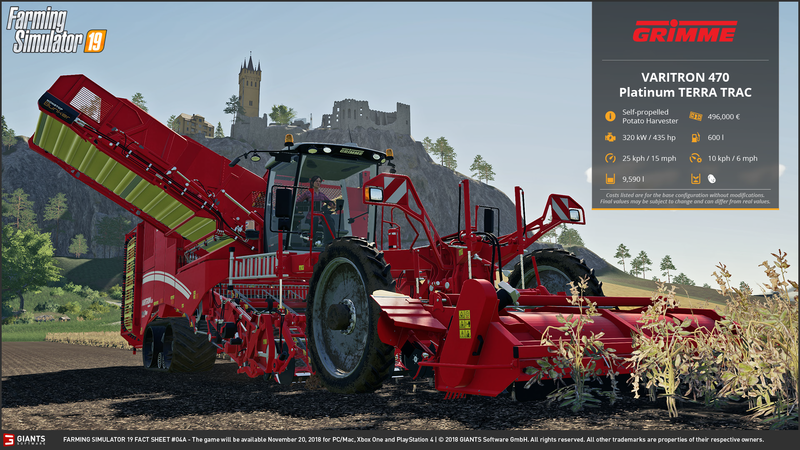 Players farming large fields will be sure to make use of this massive seeder, which has a 25.6 metre (84 foot) seeding width – this makes it a tough pull though, and it requires 640 HP to operate! This means that only a few tractors in the game, such as the Quadtrac and the Fendt 1100MT, will be capable of pulling this beast. To go along with the large toolbar is an equally large air cart – the 980 can hold 34,500 L of seed and fertilizer, though we don’t know how much of each. Players will be able to choose if they want the standard wheel setup (shown on the fact sheet) or rear twin wheels, which are sure to make the cart look even larger than it already does. In any case, this setup is sure to delight those who enjoy farming large fields, and I’m sure it will be heavily used on Farming Simulator 19‘s new American map, Ravenport. The VARITRON 470 Platinum TERRA TRAC is a very large potato harvester, and it’s safe to assume that there will be a smaller pull-behind option for those just starting out in growing potatoes. With a price tag of $496,000 it’s a hefty investment, but it’s likely a must-have for those who want to grow potatoes on a large scale. While the fact sheet doesn’t show the working width of this harvester, it does tell us that it holds 9,590 L of potatoes and has a working speed of 10 km/h (6 mph). With a relatively low capacity (particularly considering that potatoes are fairly high-yielding crops in the game), I’m guessing that players will have to be very diligent in running trucks or other tippers to ensure that this harvester keeps working efficiently. 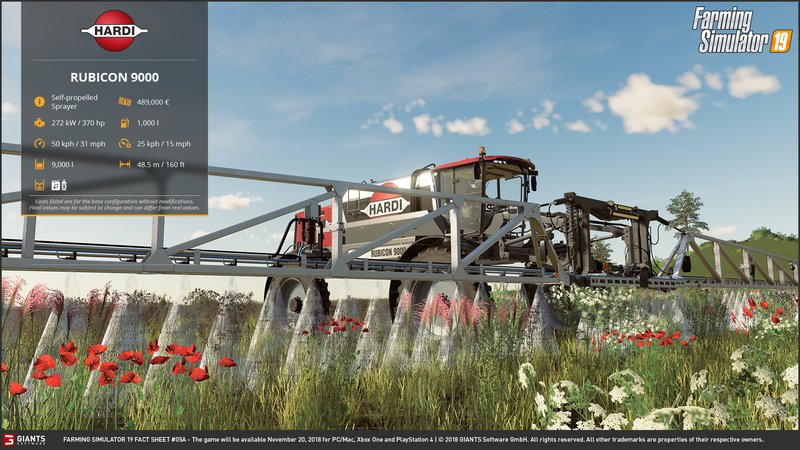 The Hardi Rubicon 9000 was shown in the Gamescom gameplay trailer, and is featured again in this week’s fact sheets. It’s a self-propelled sprayer, meaning that it doesn’t require a tractor to tow or use it, and it’s likely on the larger end of the sprayers in the game. With a capacity of 9,000 litres, a working speed of 25 km/h (15 mph), and a boom width of 48.5 metres (160 feet), this sprayer is sure to make light work of even the largest fields! It’s not cheap at $489,000, but a sprayer this large will probably play a key role on larger operations, particularly given its dual purpose: the Rubicon 9000 can spray either liquid fertilizer or herbicide, depending on the desired effect. We saw in the Gamescom gameplay demo that weeds must be sprayed with herbicide if they get too large, while we know from previous Farming Simulator games that spraying liquid fertilizer will increase the yield by 30% or 100%, depending on the player’s settings in-game. It’s important to note the working speed of 25 km/h – many players complained that the speed of sprayers in Farming Simulator 17 (they worked at 12 km/h) was unrealistically slow and made spraying an inefficient method of fertilizing. Hopefully this higher working speed will be universal among all sprayers in Farming Simulator 19. There you have it, four more fact sheets from GIANTS. These fact sheets look fantastic yet again, with exceptional graphical quality of the vehicle and equipment models and a great taste of the details on these pieces of machinery. Scholarly Gamers will be covering each and every Fact Sheet Friday and any other news about Farming Simulator 19, so be sure to check back for more information on the game’s machinery as well as new features!